Sometimes you hear so much about a book, you realize that you have to read it. The only problem for me is that there isn’t always time to sit down and read. Getting through my earlier Gamer Reads: Starship Troopers was tough last summer and took a lot of time to get through, being mainly confined to spare moments on Sunday afternoons. So after being hit on the head over and over again with Audible ads I decided to get a few free trial books, one of which was Ready Player One by Ernest Cline. The book came on my radar through a lot of podcasts I listen to and for the most part it was in one ear and out the other. Then someone on one particular podcast who I know has tastes similar to mine suggested it, making me a little more willing to read it. So after catching up on my back podcasts, I decided to give my Audible app a spin with the few free books I had on it for a few months now. 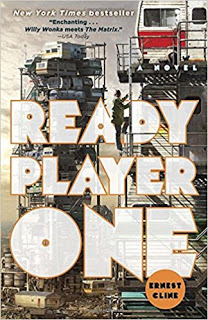 Putting Dune aside for a longer week I decided to listen to Ready Player One first. The version I listened to was the unabridged version narrated by Wil Wheaton. All told the narrated book took about 15 ½ hours to listen to, which was a big chunk of two work days plus commute times for me. To be honest I wasn’t sure how much I’d like Wheatons narration but I have to admit he did a pretty good job with it, but the voice didn’t seem to totally match the character which at times did take me out of the story. I’m just going to start off by saying the book wasn’t what I thought it would be. To be honest a lot of the descriptions people gave of the book made it sound semi-lighthearted, and even a “thrill ride!”. Instead what I heard was kind of depressing, and even dark. The books main character is Wade Watts, a teenage orphan of about 16 who lives with his druggy aunt in a highrise trailer park outside of Oklahoma City, known as “The Stacks”. It’s also 2044, and an energy crisis has occurred bringing the country and world to its knees, and poverty, joblessness, crime, and substance abuse are rampant. Wade is a computer genius who manages to feed himself by repairing and selling old computer equipment, and to escape his as aunt spends most of his days in his hideout, the remainder of a panel van in a junk heap. Following the energy crisis and advances in technology the world is addicted to (it seems like addiction to me) a virtual reality world known as the “OASIS”, where anything is possible and most of the world goes there to escape the new harsh reality. It’s here that Wade attends high school, as well as pursues his ambition to become a “Gunter”. The main jist of the story is that the creator of the OASIS, released a video upon his death revealing that if anyone can unlock the “Easter Eggs” inside the vast OASIS they would be entitled to billions of dollars, and control of the OASIS. In the death video the OASIS creator James Halliday leaves multiple clues behind in the form of various 1980’s pop culture, gaming, music and movie references. In order to get a crack at the money and power, a new sub-culture of egg hunters, known as the aforementioned Gunters has developed. Some like Wade hunt individually, while others hunt in clans. The villain of the story is Nolan Sorrento the head of a nearly militarized group of Gunters known as “The Sixers”, who are heavily funded, and part of a evil corporation called Innovative Online Solutions, IOI, that rules both in the real world and on the OASIS. Five years after the video is released no one has so much as a clue as to where the first of the three keys leading to the Easter Egg are. Then one day, while sitting in class, Wade gets an idea the clue is related to an old D&D game, and may be hidden on the same virtual planet his school’s on. So he sets off to find it, entering a dungeon and playing Joust on arcade with a skeleton king to win the first key, a copper one. On his way out he meets his long time online crush the mysterious Art3mis, who he discovers cracked the clue before him but has failed to win the Joust challenge. Thanks to a tip from Wade, going by Parzival in the OASIS, Art3mis wins the challenge shortly after him. In the meantime Wade figures out the clue to the copper gate, and visits a planet of replicas of Hallidays hometown finding the gate within a video game in Hallidays boyhood home. The gate itself is the movie Wargames, in which a player must repeat all the words and actions of the film to win the game. Wade does this and gains the clue to next key, a jade key, with Art3mis following him shortly after. The big break makes Wade, Parzival, famous worldwide and as well as Art3mis, Wade’s friend Aech, and two Japanese brothers when their OASIS names are posted on a worldwide scoreboard. But shortly after The Sixers invade the copper key site, and gate site. With his new found fame Wade, makes a grab for some sponsorship cash, and catches the attention of Sorrento who asks to meet with Wade. Wade does so, and after declining an offer to work with the Sixers, Sorrento threatens to blow up “The Stacks” thinking Wade is there, Wade still refuses thinking Sorrento is bluffing, but later “The Stacks” explode killing Wades aunt and neighbors. Wade escapes to Cleveland after, taking on a fake name and renting an apartment. After warning Art3mis, Aech, and the Japanese brothers of the attempt on his life, Wade starts a relationship with Art3mis, and his relationship the Aech Suffers. The relationship with Art3mis only last a few months and falls apart leading Wade into a year long depressive state, in which he all but gives up his hunt for the jade key. Eventually, Art3mis and Aech make a break and find the Jade key, and gate, leaving Wade in the dust if not for a clue from Aech. Shortly after Wade finds out one of the Japanese brothers has been killed in real life while attempting to gain the jade key. Shortly after the last crystal key is found by “The Sixers”, but they have yet to crack the final gate. Wade considers committing suicide until he has an impromptu meeting with Shoto, the surviving Japanese brother. Shoto, shares his real identity with Wade as well as revealing he was not really Daito’s brother in real life. The meeting with Shoto stiffins Wades resolve, cuasing him to take a calculated risk to crack “The Sixers” secrets on the crystal key. So Wade hacks IOI indicating his bills are past due, and causing IOI to capture him in the real world for indentured servitude. The risk allows Wade access to IOI’s computer systems, which he is able to hack with an illegal code he got online. Wade uncovers video footage showing IOI killing Daito, as well as a plot to kidnap, use, and kill Art3mis and Shoto. He also uncovers the clues of the crystal key, and the clues to the final gate. Wade, hacks IOI and escapes shortly after, changing his identity back to his real one so as to not get cuaght. Shortly after he reveals the video, plot, and clues to Art3mis, Aech, and Shoto. It’s at this point that Ogden Morrow (who I imagined looking like Woz for some reason), Hallidays former friend and business partner offers to help them bringing the four together in Oregon. This marks the first time Wade, Art3mis, Aech, and Shoto all meet in real life. The first meeting between Aech and Wade is somewhat poignant, since Aech turns out to be a young African American women, and not a teenage white boy. Wade and Aech quickly connect when he realizes despite her appearance she is still his best friend. Upon landing in Oregon, Wade and Aech, meet Ogden, and Shoto, but Art3mis refuses to meet anyone until the crisis of the Crystal key is over. In the meantime it turns out “The Sixers” know where the final gate is but not how to access it. Until they do they have blocked off the site of the gate with military force and heavy shields. The site known as Castle Anorak, was the former online home of the OASIS founder Halliday and his online persona the wise wizard Anorak. In reviewing videos taken from IOI headquarters the 4 protagonist reveal that the gate must be unlocked by three people at once, but can no longer reach the castle due to “The Sixers”. Following the leaking of Daito’s death video, and the kidnapping plot documents, Wade uses the momentum to call upon the huge Gunter clans to combat and defeat “The Sixers”. Also in his hacking Wade finds out a wizard (ugh, yes I know) is controlling the shield spell from inside the castle. While he was imprisoned in IOI headquarters, Wade hacked a ordinance robot in the castle to activate at a particular time and detonate a bomb within the castle? killing the wizard and troops. With shield down a huge battle begins between the 4 and the remaining Sixers including a boss battle with Serrento involving giant Japanese mechs. Serrento kills Shoto in the battle, but is then killed himself by Wade. Upon entering the castle with Aech and Art3mis and unlocking the gate, “The Sixers” detonate a super bomb known as the Cataclyst killing everyone but Wade. As it turns out in an earlier side adventure Wade got a magic quarter giving him a spare life. To say the least Wade faces the challenges of the final gate including the arcade game and Tempest, more first person role playing this time in the movie Monty Pythons and the Holy Grail, and finally decrypting the final challenge in Halliday’s office unlocked with the name of Hallidays one that got away, Ogdens wife. To say the least Wade wins it all, and even gets the girl in real life. What I liked about Ready Player One is that it’s very imaginative. Although there is a heavy weight on the whole story from the gloomy outlook on the future of our real world, the imaginings of what happens in the limitless OASIS are rather fun. The authors use of 80’s references is also rather unique and at times can get into some rather obscure details like the plots of special D&D games, and text adventures. I also enjoyed the relationship between Wade (Parzival), and Art3mis since there is an element of a first true and innocent love between them. It was one part of the story I honestly became invested in caring more about them ending up together than finding the Easter Egg. Admittedly though there are times I feel Art3mis is a bit too good for Wade, but I still wanted to see them together. I guess that also puts me on to the friendship elements of the story as well, especially the aforementioned relationship between Wade and Aech, which in the end transcends race and gender and keeps two people close, in what I felt was one of the books most touching moments. The relationships between Wade, Daito and Shoto is also interesting and something I found myself liking and even being touched by especially when Shoto reaches out it Wade following Daito’s death. I have a really hard time respecting Wade as the “hero” of this book. To be honest after he let everyone in “The Stacks” die to basically save himself, it was hard to see him positively. One top of that outside of being scared for his own life, he shows very little remorse for everyone who just died. This also goes to show that Wade is not the most moral of protagonist as well. This probably isn’t helped by his upbringing, nor his quick adoption of an atheistic self serving ideology he talks about in the first few chapters of the book. This general ideology, and me first attitude seems to be perpetuated throughout most of the book and we don’t really see Wade redeem himself till he sacrifices his freedom to infiltrate the IOI facility risking potentially not escaping, or being caught quickly. Whether that constitutes character growth, and the concepts of honor he learns from Daito and Shoto, and charity he learns from Art3mis changing his moral being is hard to say. In the end though I just didn’t feel like Wade deserved to find the egg. The other thing I find ironic is that although Wade claims to be an atheist, he seems to almost worship Halliday, memorizing his diaries and philosophies better then some remember the Bible. I might also include that these diaries are themselves filled with a lot of self serving platitudes, only reinforcing Wades self-centric attitudes and beliefs. This becomes even more ironic when Hallidays image tells Wade to “be kind” later in the book, almost laughable advice considering Halliday and Wades attitudes. Another thing that frankly kind of annoyed me was the characters all too convenient knowledge of some of what he encounters. I could see him winning the Joust game since he had a lot of experience playing with Aech, but the winning Pac-Man all the way through to level 256 in only a few hours, the memorized movie lines, and a lot of other things the characters could say and do all felt a bit to unrealistic. Supposedly, Wade had been studying all these things for five years, and memorizing Hallidays bible like diary but to have played through all these games enough to win and end them, memorized movie dialogues, song lyrics and information seems highly implausible and overly convenient writing. I mean I will openly admit one of my guilty pleasures is reading Clive Cussler novels especially the Issac Bell ones, and at times it’s amazing how the character has certain knowledge of abilities but he’s also a well educated adult, and part of a Pinkerton like group of super-detectives. Wade on the other hand is just a 17 year old know it all, with nothing more than a high school diploma. Sorry, it provided for a lot of eye rolling on my part and even took me out of the story at times. Lastly, I think the one other thing that got to me was the continued geek culture references. To be honest it’s non-stop throughout the book, and although it can be fun at times, it does get annoying. The 80’s references fall into this as well, being fun at times, but eventually getting annoying. Overall, I can appreciate the book’s originality and imagination and I can see why a film is on the way. With that said though a character like Wade’s almost seems to typify everything wrong in our society, and as I said before it’s hard to paint him as a hero in this book let alone believe he deserved to have a good ending in this book. I think most readers of this book come for the nostalgia and imaginative nature of this book, and not lessons in philosophy and morality and I think that’s why most cut the protagonist slack based on that. I also try to keep in mind that the protagonist is just a teenage kid between 16 and 18, who of course thinks he knows better, and is somewhat self absorbed.